Important: Before you do anything else, please open a support ticket. Thank you for choosing Synergy 2 to improve the quality of your productivity. At the moment, this serves as a placeholder for Synergy 2 documentation until Symless decides it is appropriate to release documentation, which we assume to be when Synergy is in a more stable state and the initial bugs are ironed out. Please note that this documentation is written by moderators with technical experience and help from Symless employees but is not considered “official documentation”. As such, if Symless decides to release official documentation, please refer to that documentation with the highest priority. This documentation will be perpetually updated to match new issues that come up and to allow the solutions to adapt to new Synergy versions that are released. What follows will be a table of contents. Please try to find an issue that is, at the very least, similar to yours and find the solution. We will also include a list of general troubleshooting steps if your issue is not found here. If those steps do not work and your issue is not found, go ahead and start a new post on the forums under Self-support and preface it with “[DOCUMENTATION REQUEST]”, and we will try to address it as soon as possible. Good luck, and if you need any more help, please contact the Synergy team at [email protected] or by using the contact link found on their homepage (www.symless.com/synergy). Thank you again. Synergy 2 is designed to be so simple to configure that anyone can use it. Synergy 2.0 beta was released in July 2017, then as a stable version in November 2017. The intention of Synergy 2 is that when installed on multiple computers of a network, it runs invisibly and securely with no intervention needed by the end user. 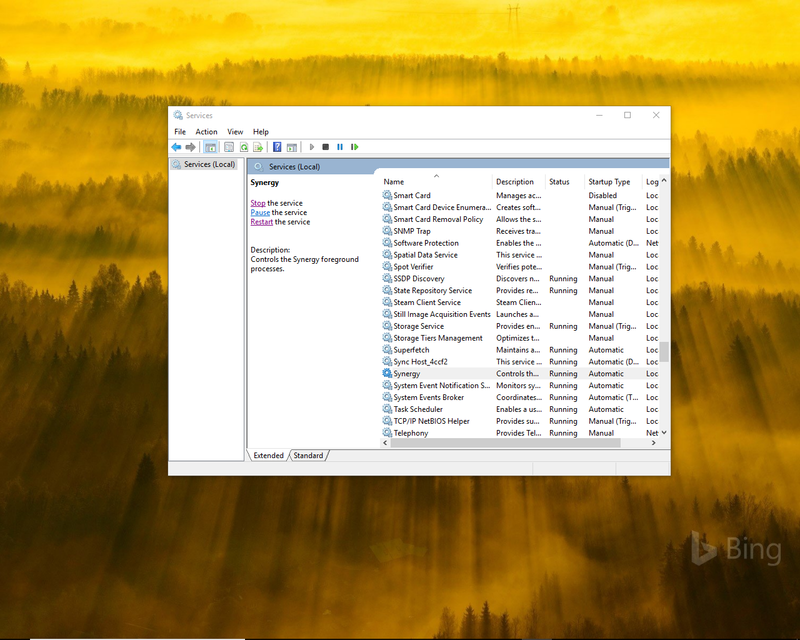 The goal is a utility running in background that, when installed, auto-configures multiple computers operating on the same network to all use a single keyboard and mouse. This auto-configuration is accomplished by having each installation read the computer’s network configuration, send it to a cloud-server where it is matched to the configuration of the other computers of the network that also have Synergy 2 installed for a secure (SSL) connection. 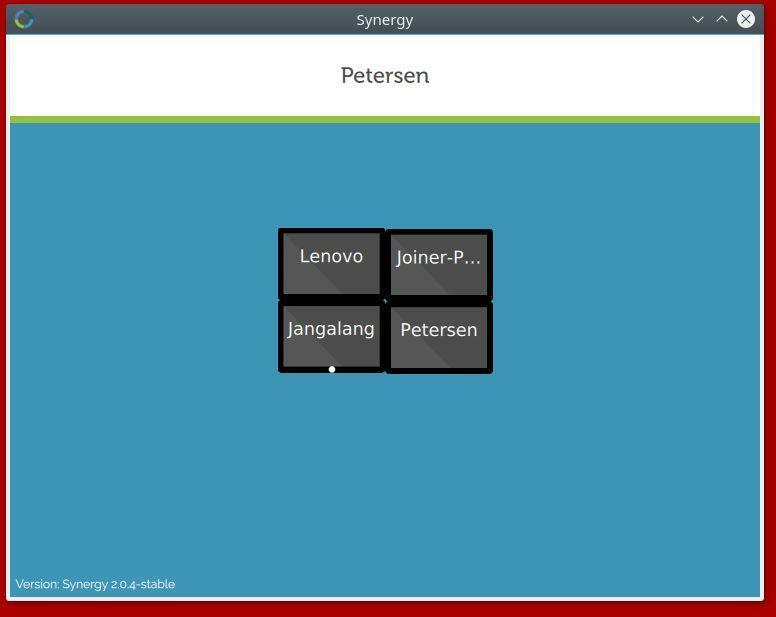 The first version of Synergy was created on May 13, 2001, by Chris Schoeneman and worked with the X Window System only. 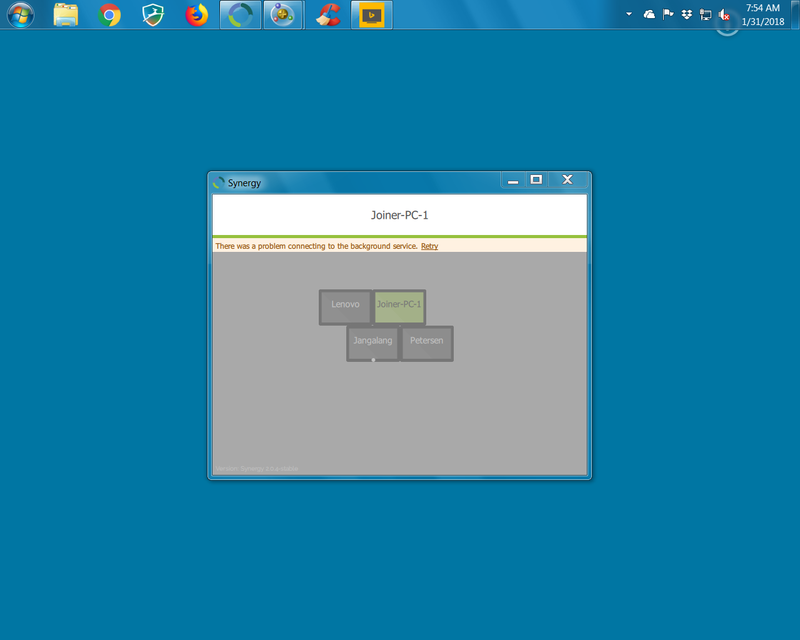 Synergy now supportsWindows, macOS, Linux, and other Unix-like operating systems. Wikipedia. Nick Bolton developed a fork of the then-dead Synergy in 2009 and popularized Synergy Pro, with frequent development improvements and updates. There is, of course, a minority of users who believe that Synergy 2.0 is not finished. If you are part of this minority, then you need to wait for Synergy 2.1. For 2.1, we're planning to add a settings screen, offline activation, advanced settings, less reliance on the cloud, and various other features to cover edge-cases. So, in other words, 2.0 is for the vast majority who want an easy configuration experience, and 2.1 will be for the minority of users who want to get under the hood and tweak settings. Read first: Synergy 2.0 is out of beta! Synergy 2.0 rapidly accumulated thousands of successful installations. However, in the modern world of computing, there is a huge mix of devices, operating systems and combinations. For some of these, Synergy 2.x.x does not function as a plug and play program. The Self-Support forum is a gathering place for technically astute users who prefer to work through issues themselves, before contacting Support for help with a problem. A number of experienced Synergy users are volunteer moderators, helping, where possible, to guide users in resolving Synergy issues. In the absence of official documentation from the developers of Synergy, we are publishing a few troubleshooting steps we have found useful. The GUI is intentionally sparse. You see the names of the computers in your network and the arrangement you’ve chosen. Rearrange the screens by selecting the screen and moving it with your mouse. The white dot indicates the server. To change your selection of server, mouse over the desired screen display and right-click. As of version 2.06 the server selection will switch to whichever computer where you are using a keyboard. You can select the computer you wish to be server by right-clicking over that display. The GUI supports opening the log by pressing the tilde key on your active keyboard. To send the log to support, right-click in the blue area of the GUI. 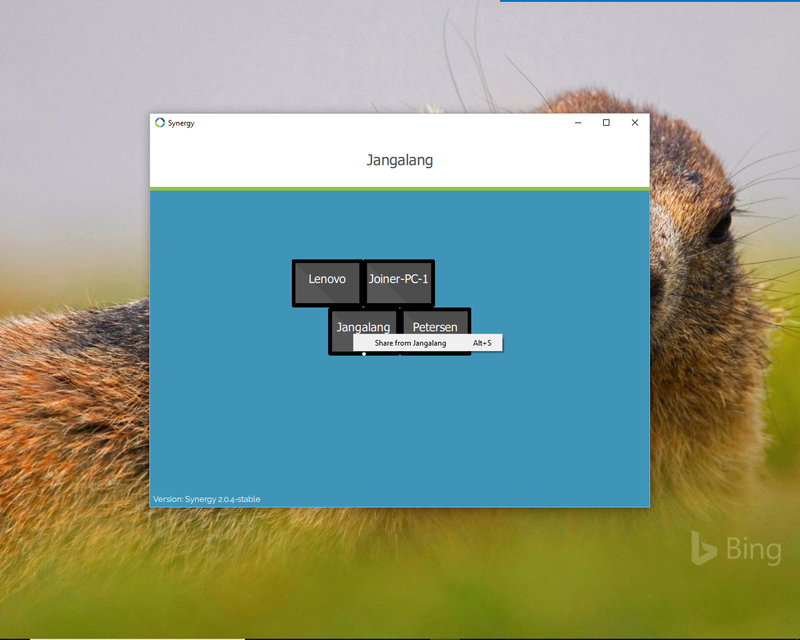 The GUI shows screens highlighted by displaying in green. This is supposed to give you an indication which computers are turned on and working properly. As of Version 2.06 this feature is not working reliably. until you install a new updated version of Synergy. Simply select the ‘dead’ screen and slide it aside and continue to use Synergy as usual. See image here. This means that you have a different setup that the standard for Linux. Usually the main display is given the ID of 0.0, but some systems might have different settings (arch Linux has lots of problems with this). This should give back a colon with a number behind it, in my case this is “:1”. Write this down or remember it. This will give you the location of the file. You can't just open this account, you need “root” privileges to write to this file. You can use your favorite text editor to open it, use the following command and replace <text editor> with your favorite text editor and replace <location of the file> with the location you got from the “find” command, Google, or the one provided by me. This will probably ask for you a password, enter this. If it says something about not being able to access something, or that you are not in the sudoers file(see below), you should ask your administrator to do this for you, from their account. <your username> is not in the sudoers file. This incident will be reported. Now you should add this line before the line starting with “ExecStart=...”, replacing <display value> with the value you got from the first command. to check if it worked. As an ArchLinux user, I was unable to get synergy to work with just this. I also had to define XAUTHORITY. To make this properly generic, I had to create my own service file. Where "myusername" is the name of your home directory. Just save it somewhere, give it execution permissions and you should be good to go. Choose Ubuntu on Xorg when logging in, or change the config to disable wayland entirely. 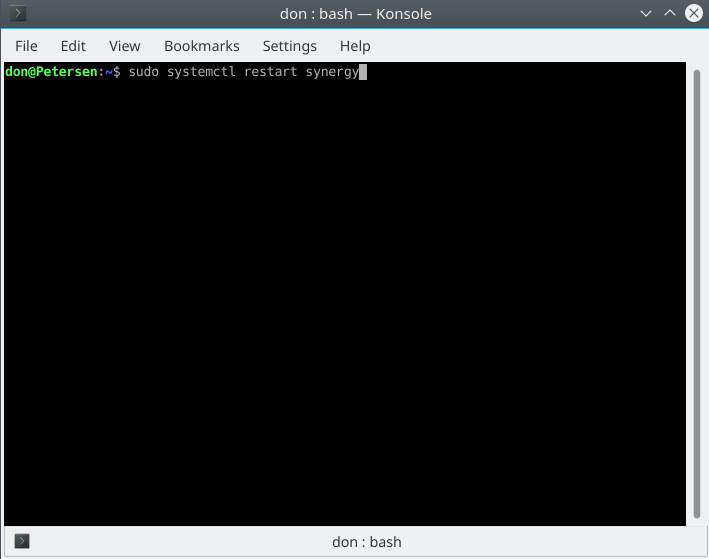 Sometimes on a new installation of Synergy or installation of an update version, Synergy does not make a solid connection with Synergy Service. These instructions and/or screenshots may vary from your unique setup. On Windows 10, press the Windows Key + R, then type “services.msc”. This should allow Synergy to start normally. Sometimes this procedure needs to be repeated several times before there is a solid connection. Right-click on the blue background and click Send log. Wait for the log to upload, then click View log. Paste the link into a new thread on this forum. Please do this for all of your computers. Let us know which log is for which computer. 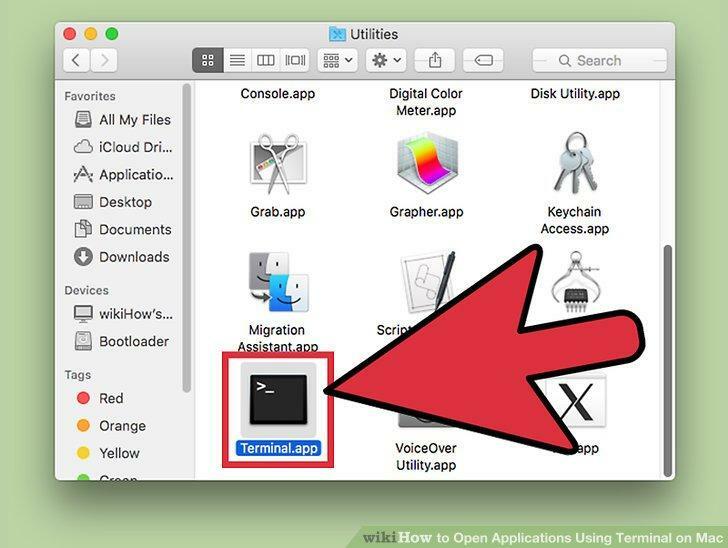 Uninstall Synergy using Add or remove programs (or Apps & features). the packagename is probably "synergy"